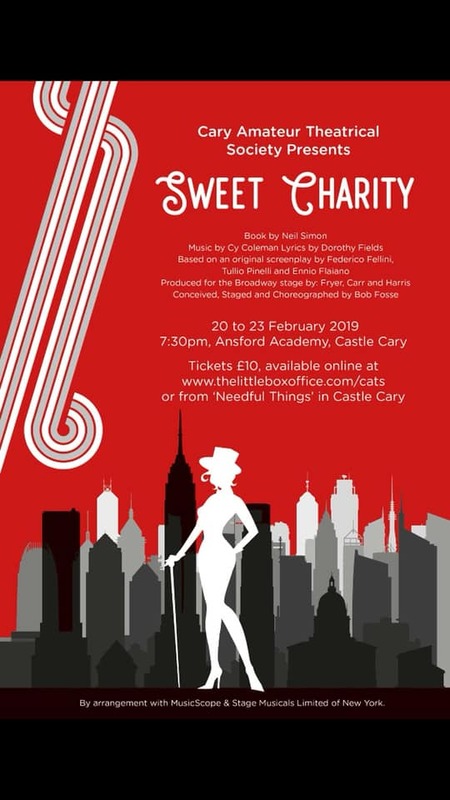 It takes a special show to provide distraction from a busy pantomime run and I consider myself very fortunate to have been offered the opportunity to attend Sweet Charity. I am sure that your Director, Luke Whitchurch, was exceedingly proud of the opening show which had pace, excellent cue bite and apparently boundless enthusiasm and attention to detail from all your friendly team, both on and off the stage. Despite containing those staples of any show choir repertoire, ‘Hey Big Spender’ and ‘Rhythm of Life’, this is not a musical which has enjoyed great popularity and I guess is unlikely to do so in the modern ‘Me Too’ environment. Nonetheless it was clearly well suited to CATS, a Society able to call upon a posse of elegant and versatile dancers and fine singers with a wide range of theatrical experience, most of whom took on several roles. In her first outing with the Society, Sarah Andrew, gave an extremely polished performance in the title role. We lived the emotional turmoil of her chequered relationships, empathized with her desire to escape her unsatisfying lifestyle and shared her sweet optimism about the future she craved. With some fabulous singing, a confident delivery of lines in a convincing American accent and apparently effortless dance intermixed, this was just the polished performance required to glue the show together. CATS is a fortunate Society to be able to offer strength and depth throughout the casting of your Principals. Vikki Whitchurch as Nickie and Abbie Smith as Helene were a great pairing as dance hall hostesses offering Charity some regular reality checks. Your voices blended well in duet. Your menfolk had the opportunity to portray some interesting characters with notable performances from Jay Westaway as the conflicted Oscar and Zack Welfare as the entirely credible, self-obsessed Vittorio. Garry Brooks as Daddy Brubeck led the colourful’ Rhythm Church’ with enthusiasm whilst Vyv Simson as Herman spent his time trying to keep his business afloat but got his moment to show his singing strength in the end! As for the ladies, Natasha Musson clearly enjoyed her role as elegant drama-queen Ursula, whilst Chloe Hobson as Rosie was a suitably naïve new recruit to the hostess world. Dance and choreography helped to put each scene into context on a well designed, fixed set. Bob Fosse is a hard act for any choreographer to follow but Amanda Thornton did his style justice! The various dance halls each had their own ‘style’ and there was energy in complex routines from start to finish. The ‘subway’ scene worked perfectly. I would have liked a slightly slicker performance from the ‘soldiers’ but I appreciate there may well have been some tired legs by then. There was height and depth within the constructed scenery but also attention to the stage picture when the action was all at ground level by the simple, natural, mechanism of a child standing on a bench in order to see better. There were periods of silent scene setting, most notable the opening. Tableau was also used to good effect. Apart from one brief queue to leave downstage right, entrances and exits worked well. Sweet Charity requires many scene changes. The ‘Elevator’ and ‘Chile Hacienda’ insert was simple but very effective. You are fortunate to have a stage wide enough to operate in two halves if required. Stage furniture was kept to a minimum; most items were manhandled by the cast and changes were quiet and generally fast. Lighting, slides and follow spot were all effective. Where, as it seemed, a problem had been identified in lighting faces at the highest point of the stage, the important lines were suitably delivered from a seated position. Sound was clear throughout. No musical can function without strong support from its musicians. 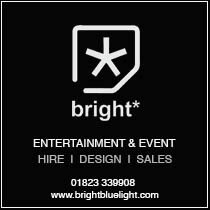 Your experienced MD, Mark Tromans, and talented band offered just that, with sympathetic underscoring of every mood and voice. This show had high production values and if there were a couple of longer than planned scene changes and tiny props ‘issues’ at the first performance, I’m sure they will be gone at the next. My guest and I had a great evening. There was a bubbling energy and supportive ‘family’ feel about this first night which was a delight to see. Somerset Fellowship of Drama. David Beach Competition.